Stuck at “Refresh” when logging in? 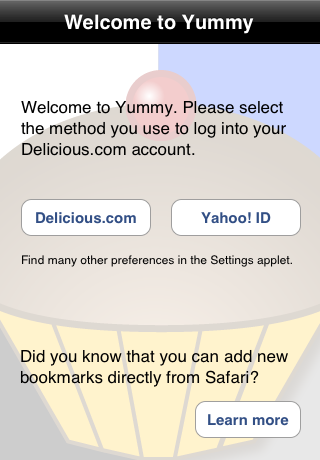 One question that puzzles some new users is, well, the first question that Yummy asks when you launch it, namely: should I log in using my Delicious.com account or my Yahoo! ID? May be it could have been clearer, but you should only select the Yahoo! ID option if you’ve linked your Yahoo! ID with your Delicious.com account. This will be the case if either you’ve made the link yourself or you’ve opened an account in the last few months. If you say you have a Delicious.com account when you have a Yahoo! ID, you’ll get a message saying that your username and password was not valid. Unfortunately Yummy “hangs” saying “Starting refresh…” The next version, due out in a month or so, has a fix for this (it’ll report an error, allowing you to try the other mechanism). But that doesn’t help you right now. So what to do? Simple. Quit Yummy by pressing the Home button and relaunch. You’ll get back to the Welcome screen and you can pick the Delicious.com option this time. One final note: why do I ask users to make the choice? The short answer is that there is no way to determine what type of account you have without trying to log in. And when you use a Yahoo! ID the process is very different to using a Delicious.com username so I can’t just try both and see what happens.